Apparently Varun Dhawan has been requesting a dance number in Sui Dhaaga and we hear that has finally been met. Up with a twist. 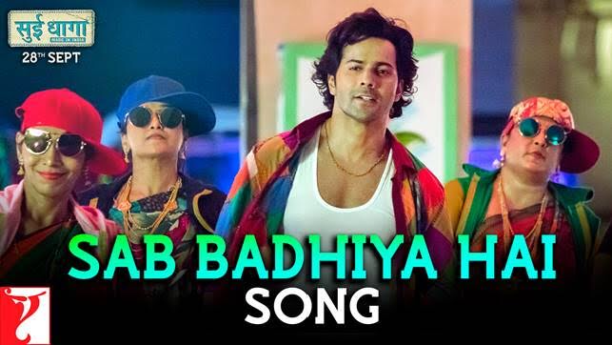 See, Yash Raj Films’ released a high energy dance number Sab Badhiya Hai that features Varun dancing his heart out only to be told by Anushka Sharma that this song won’t feature in the film or in the credits of Sui Dhaaga and that it’s only a promotional track. Varun flaunts his energetic dance moves in the song video any way, which has been choreographed by Ruel Dausan Varindani. Sung by Sukhwinder Singh, the music is by Anu Malik with Varun Grover and Anu Malik writting the lyrics of this hilarious song. Sui Dhaaga – Made in India releases on September 28.